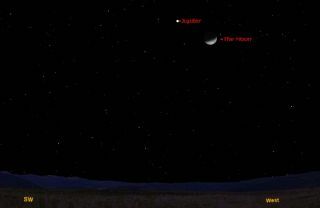 This sky map shows the location of Jupiter and the moon on Jan. 29, 2012 as they will appear together at 9 p.m. to skywatchers in mid-northern latitudes. For the second time this month, the moon is going to pay a visit to Jupiter, the largest planet in our solar system. On Sunday and Monday evenings (Jan. 29 and 30), a fat, waxing crescent moon will appear to slide past the planet Jupiter. Of course, the moon is much closer to Earth than Jupiter and as such, can change its position against the background stars rather quickly. In fact, relative to the background stars, the moon will appear to move east at roughly its own apparent width each hour – or about 12 degrees (on average) over a span of 24 hours. The sky map of Jupiter and the moon with this story shows how they will appear together at about 9 p.m. local time to observers in mid-northern latitudes. Without a doubt, Jupiter and Venus are currently the bright evening "stars" in our sky. Jupiter is perched at Venus' upper left during the early evening hours. The "King of the Planets" shines brightly enough — two-and-a-half times brighter than Sirius, the brightest star (itself located at dusk shining brilliantly low in the southeast sky). And yet, Venus is still nearly five times brighter than Jupiter. The two planets will be slowly edging closer together in the coming weeks. They'll appear closest to one another, just 3 degrees apart, Mar. 13. This week, Jupiter doesn't set until around midnight local time, which means it's still high enough at nightfall for steady images in a telescope; Jupiter is enveloped like Venus in a perpetual cloud cover. Broad cloud bands cross the planet and are visible even in a small telescope, appearing to cross its disk parallel to the planet's equator. Jupiter's disk is noticeably flattened at its poles because the giant planet is turning so fast on its axis — once around every 9 hours 50 minutes. For comparison, if Earth rotated on its axis as fast as Jupiter, our day would be only 53 minutes long! A small telescope should also reveal four of Jupiter's moons — the famous "Galilean Satellites" that were discovered by Galileo with his crude telescope in January 1610. It's always interesting to watch these four moons through a telescope as they appear to change their positions relative to each other from hour to hour and from night to night. On Sunday night, for instance, if you train a telescope on Jupiter — or even steadily hold binoculars with at least 7-power magnification — you'll see two moons, Ganymede and Callisto, on one side of Jupiter, while the other two, Io and Europa, will be on the other side. But on Monday evening, three moons will be gathered on one side (Ganymede, Io and Europa) while Callisto sits by itself on the other side of the big planet. Editor's note: If you snap an amazing photo of Jupiter and the moon, or any other skywatching target, and would like to share it with SPACE.com, contact managing editor Tariq Malik at tmalik@space.com.